As I am a little lazy, I compiled the publications we made recently on our Facebook page (https://www.facebook.com/BadassForce/) and I enhanced them with some more explosive comments. just like Michael Bay would do. 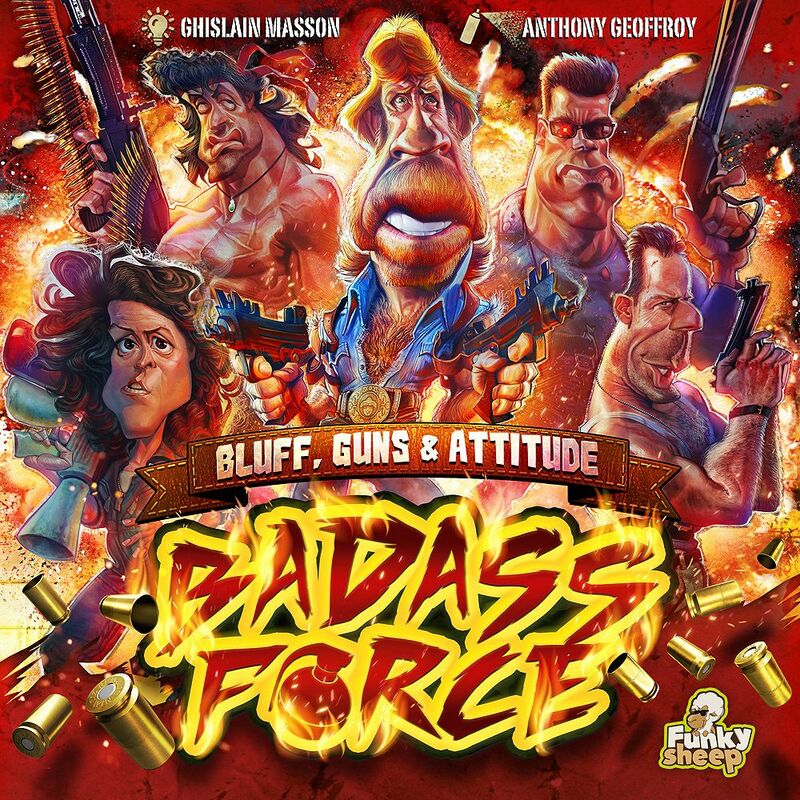 So, what is Badass Force? Before talking about the game, a little word about the amazing illustrations from Anthony Geoffroy. (https://www.instagram.com/anthony_geoffroy/) His work gave life to our game and we really hope you will like it as much as we do ! And now, I will try to train you on the basic mechanisms of Badass Force. 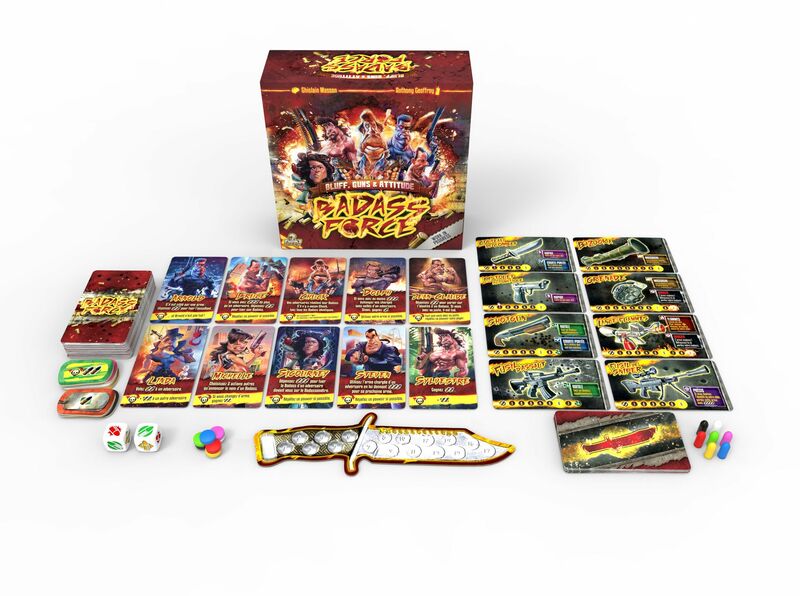 Badass Force is a bluffing game with a strong “Action Movie” theme. But it is also a game with a lot of tactics and opportunism. You will probably need 2 or 3 plays before getting all the subtleties related to the powers of the Action Stars and their weapons. But do not worry, we are here to help! 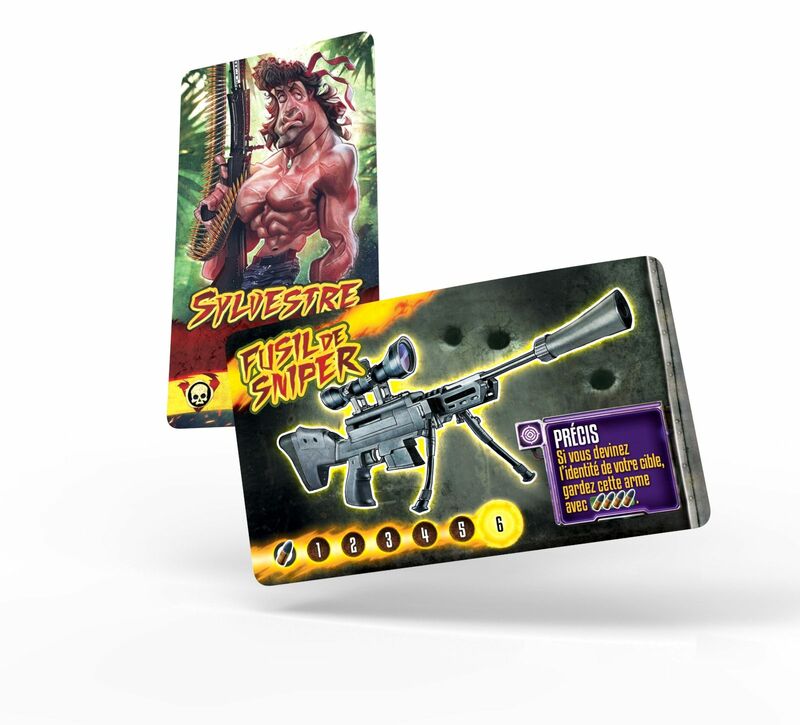 The game can be played with 3 to 7 players, (the sensations are radically different at the two extreme) within a 25 to 45 minute time frame (shorter than your average 80’s Action Film Blockbuster). The goal of the game is to be the first to reach 16 points on the Badassometer. There is no player elimination : instead, you come back, with a vengeance ! At the beginning of the game, everybody possess the same 7 characters. And everybody has a weapon and may use it (that’s very bad, we know). A good thing to know : you gain points by killing your opponent's characters (that’s also bad, but fun in this game). During the game, every player will always have a Badass in front of them. We’ll choose a first player with a secret method that we cannot reveal just yet. And beginning with that first player, every player will get the chance to play, one at the time, in a clockwise order until there’s a winner. If you have any question on the gameplay, the theme, or the origin of the project, feel free to ask! La meilleure façon de rester à jour est de suivre sur Facebook ... À moins que vous n'aimiez pas FB. Je vais essayer de vous tenir au courant ici. mais j'ai tester le jeu 2 années de suite, a "Paris est Ludique"
Played this at Essen and only at the end I realized that the designer of this was the same of Not Alone (that I love) and I have to say it was lots of fun, better than what I was expecting! Is there a chance for a german version? For the moment we have nothing planned for a german version. Guys, we need 15 more like to unlock the social stretchgoal of the campaign, even if you are not a pledger now ( you should seriously think about becoming one ), can you like this page to help us ! ?